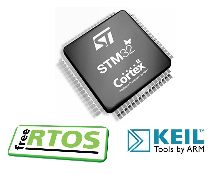 To start working with FreeRTOS first you need replace some of the ARM processor startup 'registers', by the FreeRTOS ones. But this process is not like install a new library, plugin nor compile something, it's just different! and that's why many developers give up! Here you can see how to configure the FreeRTOS aiming run on ARM Cortex-M3 using the Keil uVision IDE. That's it! now let's blink a GPIO pin and see if works!